Heart disease is the leading cause of death in Australia and now, in a major boost for drug development, scientists will be able to mimic its effects in a petri dish after identifying a new, reliable way of producing heart cells in the laboratory. Published today in the prestigious journal, Nature Methods, the Monash University-led research shows how human heart cells can be consistently produced from embryonic stem cells, creating a potentially inexhaustible source for research and drug discovery. Dr. David Elliott, and Professors Andrew Elefanty and Ed Stanley of Monash Immunology and Stem Cell Laboratories led the Monash group which collaborated with a number of institutions in Australia and overseas. 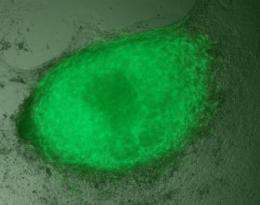 Dr. Elliott said the researchers were able to isolate the heart cells by turning them green. "We linked a green fluorescent marker - originally from a jelly-fish - to a gene found in heart cells, causing them to glow," Dr. Elliott said. "Using this cell line we have discovered two new cell surface proteins that we can use as 'handles' to allow us to grab only the cardiac cells from cultures containing different cell types. Importantly, we can use these handles to isolate and study cardiac cells grown from the stem cells of heart disease patients, and, in this way model heart disease in a dish. "This finding is significant because up until now the development of drugs to treat heart disease has been hampered by the lack of a dependable supply of heart cells for experimentation," Dr. Elliott said. Professor Elefanty said that in the future these markers could be used to pull out heart cells from cultures without having to use genetic modification to make the desired cells visible. "We are now starting to make significant steps in the search for stem cell based therapies for heart disease and our findings will drive further research and discovery in this field," Professor Elefanty said. "This breakthrough is the result of more than ten years of work by the world-leading team at Monash and it illustrates the benefits of investing time and resources in stem cell research." The team, led by Professors Elefanty and Stanley, are using similar strategies to isolate insulin-producing cells for the treatment of diabetes, and blood cells for the treatment of leukaemia. The study was undertaken by a collaboration of 26 researchers from the Monash School of Biomedical Sciences, Monash Institute of Pharmaceutical Science, Walter and Eliza Hall Institute and Baker IDI Heart and Diabetes Institute, in Melbourne, as well as Leiden University Medical Centre and Netherlands Proteomics Institute, in the Netherlands. The Australian researchers were funded by the Australian Stem Cell Center, the National Health and Medical Research Council of Australia, the Heart Foundation and Victorian State Government. Complementary research involving Dr. Elliot, and Professors Stanley and Elefanty was also published today in Nature Biotechnology.